The trackball mouse aids with avoiding carpal tunnel syndrome and it saves space. The small left button is set to the middle button and the small right button is set to "Back" for internet and file browsing. The mouse on the left side serves two purposes: First, this style of mouse has a better scroll device than the trackball mouse, which doesn't really have one. Second, if it's ever necessary to get the precision of a regular mouse (editing images, for example), then it is available for use. The laser is currently covered with a small sticky pad to avoid any cursor movement from it. The wireless mouse is used for viewing the computer desktop on the TV, away from the computer monitor. It's great when watching internet TV shows on an actual TV (hulu.com is great for internet TV). Also note the USB extension cord, which is useful for any other peripheral devices one would need to plug in temporarily (a camera, for example), and the wireless headphones, which allow for freedom of movement and less cord clutter. The small device under the monitor is a CRYPTOCard, used for accessing remote computers at work. The monitor is on a base that rotates and adjusts vertically, making it perfect for getting just the right position for the user. 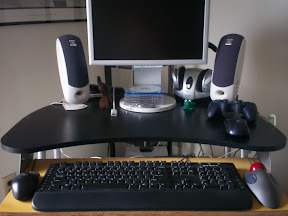 The combination of the trackball mouse and vertically adjustable monitor have significantly improved the ergonomics of my computer desk, making me a lot more comfortable, especially during long hours of work (or play!). 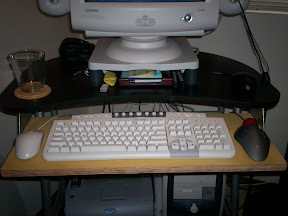 Here's an older version of the setup with an older left mouse and keyboard and without the wireless mouse. By the way, all of these devices except the keyboard are from Logitech. I really like their computer input devices. The software isn't completely bug free, but once I got the settings where I like them everything works just fine. I haven't used the wireless mouse as much, but I advise getting a USB extension cord with it, as its range is limited.